Traveling with kids can cost so much money! But I’m going to share our family secret to save money while both allowing our kids to chose a souvenir many times on our trips and also keeping the cost under $2 per child at each place. A family excursion is something we look forward to, whether it is a day trip to a nearby destination or a longer trip to a faraway place. Collecting souvenirs along the way is usually a really fun part of visiting new places, whether they be tourist traps or high-class attractions. With four kids in our family (or even if you have only one or two) the spending can go over budget quickly. Traveling is expensive, and traveling costs with kids can get out of hand, especially if every stop along the way is commemorated with an pricey souvenir that your child just HAS to have, and then either loses, forgets about, or breaks before you arrive back at home. Now, there is nothing wrong with choosing a special, meaningful (even expensive) souvenir for a child while on a trip. We have a few of those — mouse ears from you-know-where, license plate from Alaska, kukui nut lei from Hawaii, geodes from Arizona — to name a few. 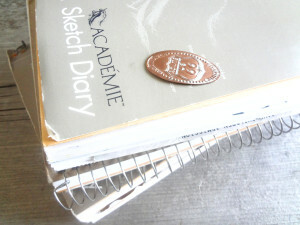 Postcards (inserted into journals) and pressed pennies are our souvenirs of choice when traveling with our kids. But to avoid over-spending and whining children (and save money! ), our simple solution is to allow each child to chose a postcard wherever we stop and if there is a pressed penny machine, we get one of those too — on Mom and Dad’s tab. Anything else that someone wants must be purchased with his or her own money (sometimes we subsidize each kid with a stake before leaving home which they can choose to spend or save, otherwise this would be allowance or gift money from the child’s own wallet). This gives the kids the chance to look around in the alluring gift shops, but frees Mom and Dad from the begging and pleading and spending of cash. The kids know before going in what Mom and Dad will buy and what they won’t buy. It allows the kids the chance to make a decision about which postcard sums up the place best for him or her (or just has a cute cat on it, or whatever) and satisfies the desire to purchase and have something to keep from each special place. Most postcards cost less than $1. And those pricey items? Suddenly, the kids are more choosy when those items have to be purchased with their own money. Pennies that have been imprinted with a design have grown in popularity in recent years, with serious collectors across the country, so we are finding the machines in more and more places. 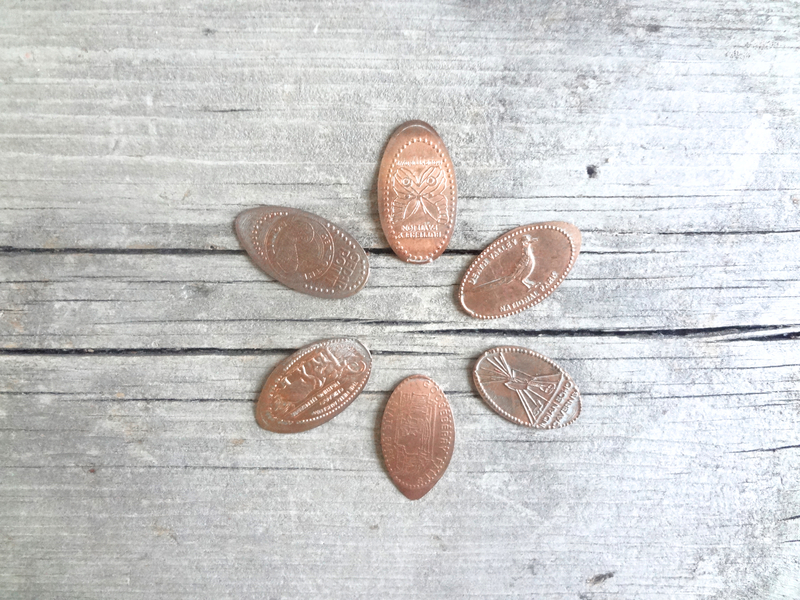 They usually cost $.50 + the penny, and you can select a design and watch them being pressed before your very eyes. We travel with a coin purse full of quarters and shiny pennies for this purpose. You can purchase little books to keep your pressed pennies in, and each of our kids has one. I also get a penny for the grown-ups and we keep them in a little dish at home as remembrances. When our kids were younger, we also traveled with a dedicated back pack with a small art journal for each child inside, and scrapbooking supplies like markers, glue sticks, tape, scissors, and photo corner mounts. 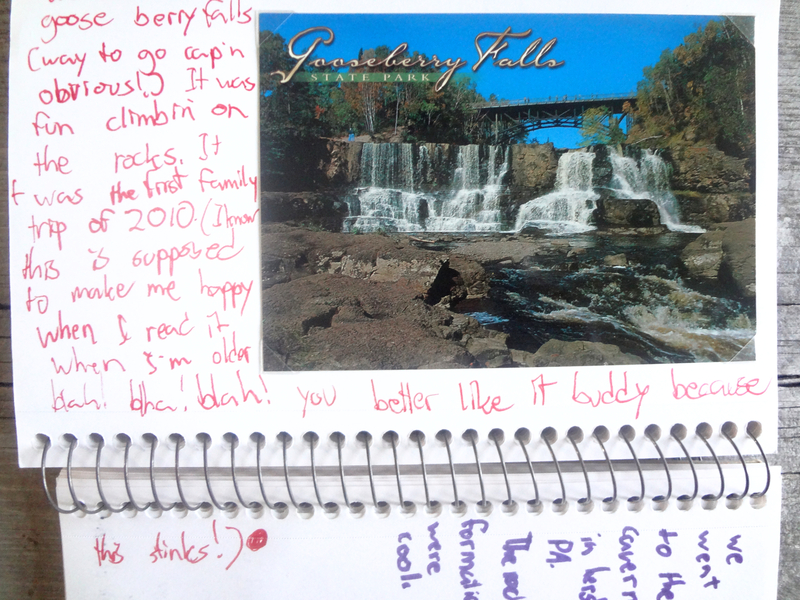 While waiting at restaurants, or in the hotel in the evenings, the kids would mount their postcards in the journals and draw or write notes about their days. 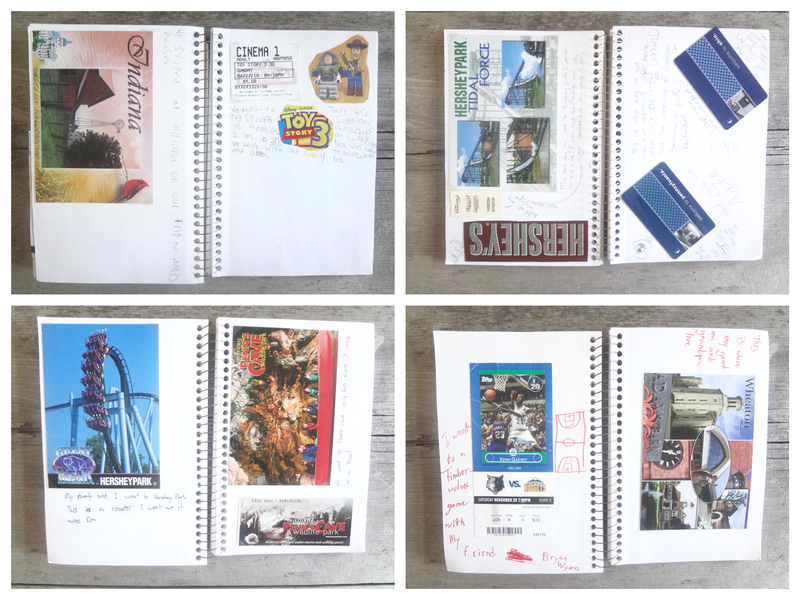 We also collected ticket stubs, pamphlets, maps, and the like from the places we visited and they could cut things out to add to their journals. It goes without saying that these journals are really fun to look back on now and help us remember those trips with the family. This teen is clearly over the joy of journaling for posterity — ha! I think this is the last entry I made him make about six years ago. Now he can use his cell phone to store his memories. Our kids are growing fast, and soon we will have a 20-year-old, two teenagers and one almost-tween. The older ones take pictures with their cell phones instead of journaling now, but we still buy postcards and pennies to commemorate our family trips together without breaking the bank. Leave a comment about how you and your family like to commemorate your trips or tips for budget friendly travel with kids. 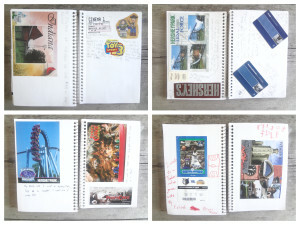 Love the scrapbooking along the way idea, wish I would have done that when our kids were little. Lots of good tips, thanks for sharing! These will be cherished memories for your kids and – probably – they will carry on these traditions with their own families. I love this!! 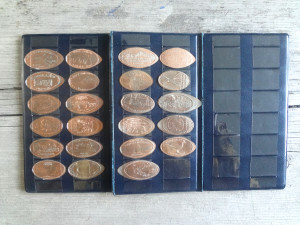 Not just because I already collect commemorative pennies, they are some of my favorite souvenirs. A mini M&M tube works perfect for quarters and shiny pennys stacked up. We did one for each of the kids on a Disney trip. That’s a great tip, Leah! Thanks!